Darfur Now is a story of hope in the midst of one of humanity’s darkest hours – a call to action for people everywhere to end the catastrophe unfolding in Darfur, Sudan. 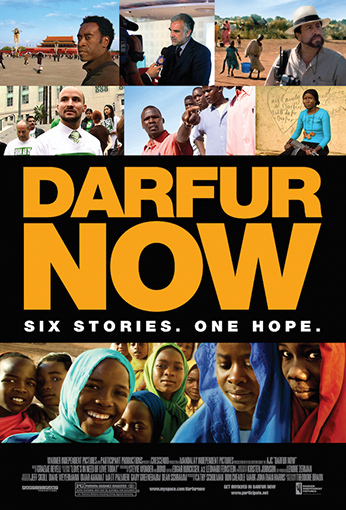 In this documentary, the struggles and achievements of six different individuals from inside Darfur and around the world bring to light the tragedy in Sudan and show how the actions of one person can make a difference to millions. In Darfur Now, we meet: a politically inexperienced college student who dedicates himself to getting a bill passed to keep California State funds out of Sudan; a Prosecutor of the International Criminal Court in The Hague that relentlessly investigates the complex and horrifying crimes in Darfur; actors Don Cheadle and George Clooney who travel the world to pressure government officials and world leaders to take action about the situation in Darfur; a Darfur Village refugee that has taken on the challenging task of leading and protecting a camp of 47,000 internally displaced Darfurians; an Ecuadorian, whose socially aware and politically committed parents inspired him to leave behind his own family to lead the World Food Program in dangerous West Darfur; and a mother whose own son was beaten to death as he clung to her back as she fled her West Darfur Village when it was attacked who has to choose between abandoning her home or joining the rebel forces. In addition to these six people, the film also features His Excellency Abldalmahmood Abdalhaleem Mohamad, Sudan’s Ambassador to the United Nations in New York. A career diplomat, His Excellency articulates Sudan’s position on the Darfur crisis from the perspective of a government that feels it has not been fairly characterized by the world’s media. The struggles of each these individuals outlines a different facet of the ongoing crisis in Darfur – but they all point to the need for immediate action. Each story is an inspiration for ordinary individuals to become involved to resolve the conflict and bring hope and peace to the people of Darfur.